Believe it or not, there was a time when wine was more widely consumed than water. During the Dark Ages, water was often unsafe to drink, so wine was drunk (pun intended) at nearly every meal as a safer alternative. 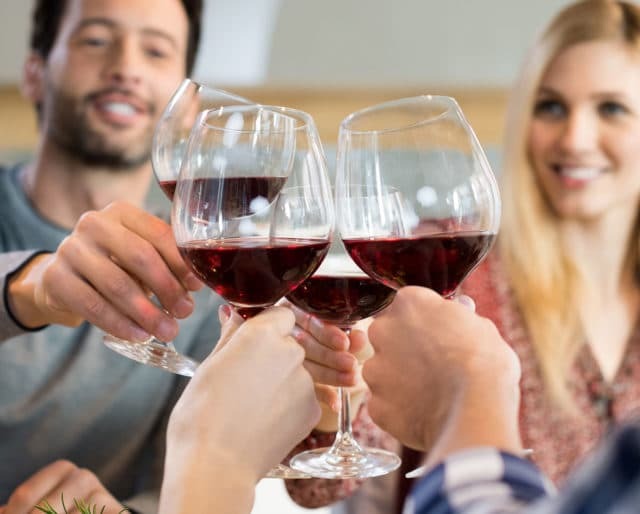 Centuries later, wine is still praised for both its health benefits and the unique role it has played throughout history. For National Drink Wine Day on Feb. 18, we get out our corkscrews, let the wine flow, and reflect on this healthy, historical beverage that also makes us tipsy. When it comes to health, not all wines are created equal. According to experts, the wine varietal that packs the biggest health punch is Pinot Noir. While red wines are generally considered to be healthier than white wines, Pinot Noir is the red wine that contains the most resveratrol—a plant compound that reduces cholesterol and blood clots and increases longevity. A glass of Pinot a day keeps the doctor away... right? As the old saying goes, wine gets better with age. Not only does a mature wine take on subtle nuances and textures that you just can't find in a new wine—it can also transport you to the past. Opening a vintage wine is like opening a time capsule—its flavors give you hints about the soil and weather the grapes grew in, the landscape of the country the wine originated in, and what was happening in the world at the time the wine was bottled. What better way to celebrate wine's role in history than to enjoy a vintage wine? In Ancient Egypt, wine was typically consumed with natural sweeteners, such as honey, dried fruits, or very ripe, slightly dried grapes. Not only did these sweeteners make the wine more palatable—they also caused it to re-ferment, increasing the alcohol content and making for some very tipsy Egyptians. So grab your fancy wine glasses, invite your friends over, and do like the Ancient Egyptians did (bonus points if there's a cat present)! While beer is notorious for causing that dreaded beer belly, you can drink wine without worrying about your waistline. Wine has few to no carbohydrates and not an ounce of fat—although it does contain calories (bummer). When consumed in moderation, wine is said to be able to help you regulate your weight. But watch out—too much alcohol can make you hungry and head straight for the fridge! Let's not forget the real meaning of National Drink Wine Day (besides giving us an excuse to drink): to reflect on the health benefits of wine. When consumed in moderation, wine can reduce the risk of type II diabetes, heart attack, strike, certain kinds of cancers, and liver disease. It can also lower the bad cholesterol (LDL) and boost the good cholesterol (HDL). Wine has a rich history—the oldest archeological evidence of wine production was found in Georgia (the country, not the state) and dates back to 6,000 B.C. No beverage has enjoyed such a ubiquitous presence across civilizations and epochs as wine. While wine played a central role in Ancient Egyptian ceremonies, the Greeks worshiped Dionysus or Bacchus as the gods of wine, and the Romans continued the tradition. Wine consumption has also been an important Jewish ritual since Biblical times and was later adopted into Christianity.